The State Department warned the White House two years ago that rejecting international standards against torture when dealing with detainees could put U.S. troops at risk. A department memo from Feb. 2, 2002, surfaced Thursday as President Bush said he ordered U.S. officials to follow the law while interrogating suspected terrorists. Mr. Bush sidestepped an opportunity to denounce the use of torture. "What I've authorized is that we stay within U.S. law," Mr. Bush told reporters at the close of the G-8 summit in Georgia. 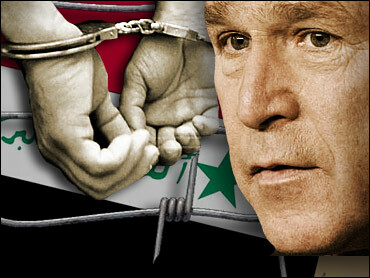 Asked whether torture is ever justified, Mr. Bush replied, "Look, I'm going to say it one more time. … The instructions went out to our people to adhere to law. That ought to comfort you." In a related development, The Washington Post reports intelligence officers ordered the use of dogs to frighten detainees at Abu Ghraib. Two dog handlers even had a contest to see who could make more prisoners urinate out of fear, according to testimony. The State Department memo warned that failing to apply the Geneva Conventions to detainees from the war in Afghanistan — whether al Qaeda or Taliban — would put U.S. troops at risk. The State Department memo followed recommendations from the Justice Department advising the president he could suspend international treaties prohibiting torture. The Justice Department also told the White House that U.S. laws against torture do not apply to the fight against terrorism. The department memos say torture "may be justified" against al Qaeda detainees in U.S. custody abroad and laws and treaties barring torture could be trumped by the president's supreme authority to act as necessary in wartime. Democrats say that by suggesting that Mr. Bush could legally authorize torture, the memos would have created the legal foundation for Iraqi prisoner abuses at Abu Ghraib prison. The investigation into that abuse has turned on whether official policy of higher-ranking officials approved or encouraged the abuse. Reports of harsh methods against detainees now cover prisons in Afghanistan and the Guantanamo Bay facility, as well as those in Iraq. According to reports published Thursday, Defense Secretary Donald Rumsfeld in late 2002 authorized interrogation procedures including "fear of dogs" and "stress positions." Lawyers for Joint Chiefs Chairman Gen. Richard Myers worried that some interrogation tactics placed Myers in legal jeopardy. Mr. Bush said Thursday he does not recall seeing any of the Justice Department advice. Five days after the State Department memo was written, Mr. Bush decided the Geneva Conventions apply to Taliban prisoners but not to captured al Qaeda terrorists. Quoting sworn statements by dog handlers at Abu Ghraib, The Post reports that the highest ranking military intelligence officers at the prison approved the plan to use unmuzzled dogs to scare prisoners. One claimed that a two-star or major general suggested the canines' use. At least one detainee testified that he had been bitten by one of the Army dogs. Accounts of an ongoing Army investigation of Iraq's prisons indicate that many detainees, including some in the high-security section of Abu Ghraib where the abuse took place, were held on flimsy evidence. The handlers' claims raise questions about the contention by Mr. Bush and others that responsibility for the abuses at Abu Ghraib is confined to a small group of soldiers. Only seven low-ranking GIs have been charged with crimes.